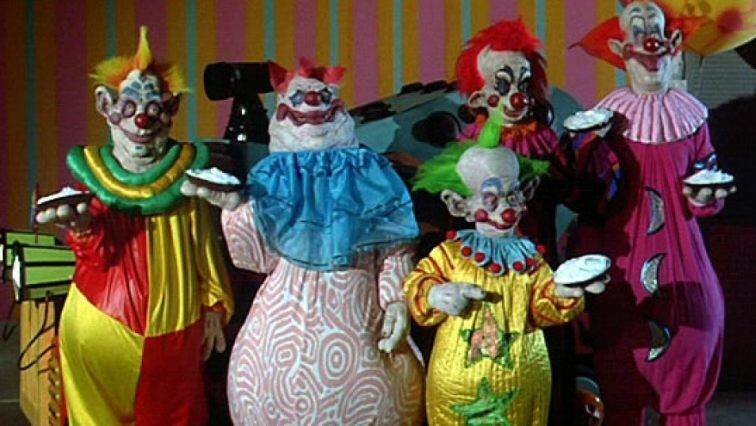 WMSE 91.7FM and The Times Cinema are teaming up to bring you KILLER KLOWNS FROM OUTER SPACE – the most forehead-exploding big-budget scifi/horror/comedy of the ‘80s, written and directed by the special effects wizards behind CRITTERS. All tickets are $5. Doors and Zero Hour DJ Andy Turner spins at 8PM. Film at 9PM. A circus tent-shaped meteor crashlands in the forest, releasing an army of neon-colored, face-painted intergalactic creatures who mummify humans in cotton candy cocoons and slurp their sweetened blood through crazy straws. These diabolical bozos mow through the populace using only the most entertaining means: invisible cars, carnivorous shadow puppets, popcorn blasters, decapitating boxing matches, hand-to-spinal-cord ventriloquism and much, much more. The only people with the guts to stand up to these extraterrestrial sillybones are two kind-hearted teens and the horny local ice cream vendors. Watch for thundering man’s-man actor John Vernon as the homophobic small town cop who just isn’t gonna put up with any of this space clown s**t. All this topped off with a theme song by pioneering goofpunk band The Dickies. Not to be viewed by anyone who fears clowns or enjoying life.